To get to Part 1 of this blog post, click here. Do you hate PowerPoint presentations? Well, you probably have endured a lot of gruesome slides throughout the course of your professional life. But despite the usual wisdom that PowerPoint slides for presentations should be avoided whenever possible, I actually think that some well-crafted slides presented in the right context can be a very good thing. In fact, there are a number of slides that had a very positive impact on me in my knowledge management career. I treasure them because they manage to bring complex concepts to the point and often communicate an entire lesson’s worth of insight just with one diagram, graph or image. 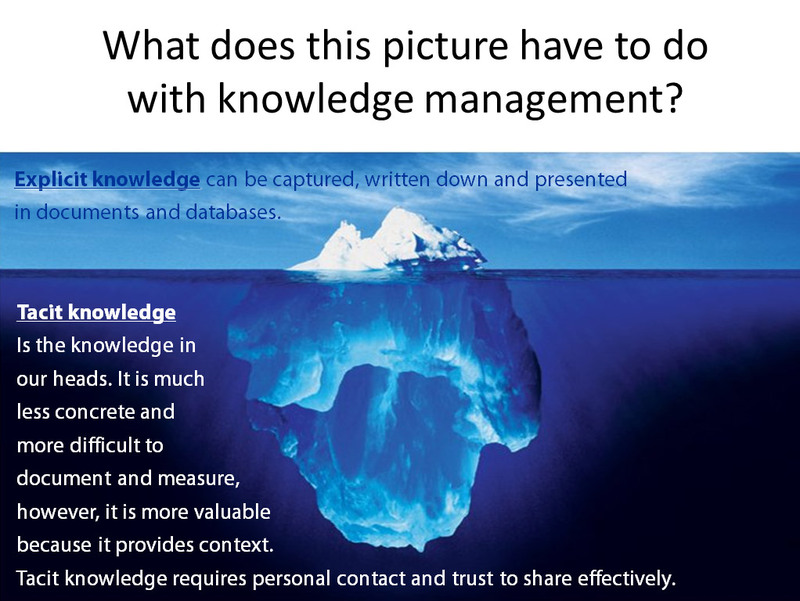 Here’s a list of ten powerful slides on knowledge management that have influenced me, which I am posting in two parts (for Part 1 click here). See for yourself whether you can get some inspiration from them. The innovation adoption curve by sociology professor Everett Rogers is a model that distinguishes between different types of adopters of innovations, based on the idea that certain individuals are more open to adaptation than others. Rogers innovation adoption curve is useful to acknowledge that trying to quickly convince all members of an organization of a new controversial idea is useless. Instead it makes more sense to start with winning over innovators and early adopters first. Also the categories and percentages can be used as a basis for setting expectations with senior management and estimating target groups for communication messages. Needless to say that when we introduced corporate social networking in our organization, the adoption pattern looked exactly like the above. This was part of a presentation given by Linda Stoddart from Haute Ecole de Gestion in Geneva during UNSSC’s Knowledge Management course “Think UN, Act Smart”. It’s like a light bulb being switched on when you suddenly realize why you always felt in a certain way when trying to promote KM in your organization, and what conditions need to come together to make complex change happen. Now this is the only slide among this selection that I have created myself. For all its flaws (e.g. that it looks at history from a Western perspective) it is particularly important to me because it illustrates the massive challenge that we face with regards to managing the amount of knowledge that humankind is producing. In addition, it also acknowledges the fact that one of the main drivers underlying this monumental change towards a knowledge society is technology. This is important, as in particular in the KM for Development sphere there is often a dismissive view of technology as mere "tools” that should just follow user needs, while disregarding the fact that it is often technology itself that is creating user needs in the first place and therefore is triggering and reinforcing culture change. These slides are part of a PowerPoint adaption of the video “RSS in Plain English”, and I’m featuring them here as a tribute to the fantastic work that the CommonCraft blog does in producing simple and easily understandable instructional videos on different topics (of which it is the ‘technology’ and ‘social media’ videos that I benefited from the most). Anyone struggling with communicating difficult topics in a presentation can learn a lot from the methodology of the “In Plain English” video series. And it also illustrates that the main key to success in doing a presentation (yes, you can do something similar even with PowerPoint) is telling a convincing story. 10. Shift Happens – Did you know? This is a quite a famous presentation that has been floating around since 2007 in different versions. It originated from a presentation that Karl Fisch gave to a group of education professionals, and since then has been revised and turned into a video (still based on PowerPoint slides) by Scott McLeod and the company XPLANE. Despite its somewhat sensational tone it serves as an excellent teaser to discuss the changes we are going through as a society and the implications this has for our learning. I usually use a few selected lines and numbers of the presentation when I do training on knowledge management, to set the stage for explaining why we need to deal with KM in the first place. The latest version of the presentation can be viewed as Youtube video here, and older versions are available in the ShiftHappens Wiki. Do you hate PowerPoint presentations? Well, you probably have endured a lot of gruesome slides throughout the course of your professional life. But despite the usual wisdom that PowerPoint slides for presentations should be avoided whenever possible, I actually think that some well-crafted slides presented in the right context can be a very good thing. In fact, there are a number of slides that had a very positive impact on me in my knowledge management career. I treasure them because they manage to bring complex concepts to the point and often communicate an entire lesson’s worth of insight just with one diagram, graph or image. 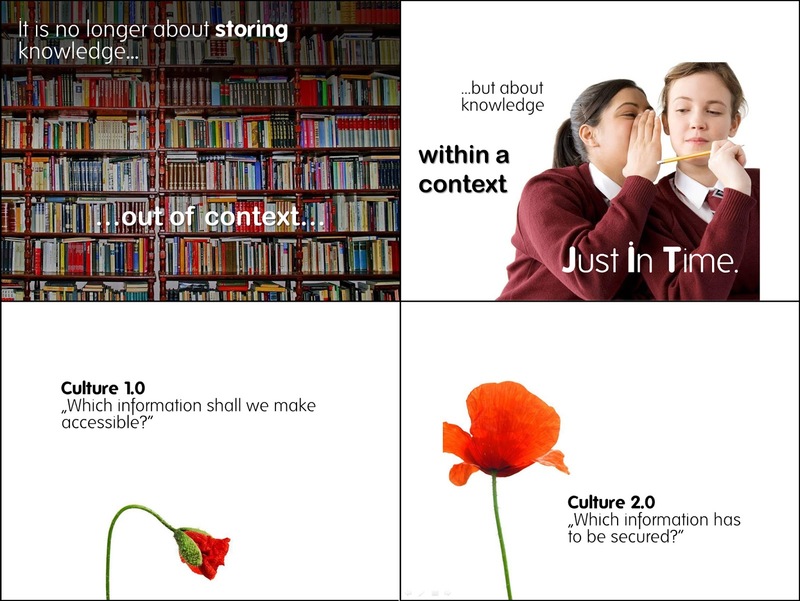 Here’s a list of ten powerful slides on knowledge management that have influenced me, which I am posting in two parts (for Part 2 click here). See for yourself whether you can get some inspiration from them. This graphic is taken from Chris Collison’s and Geoff Parcell’s book “Learning to Fly”, considered by many to be the bible for KM practitioners. They use it to describe the process of how we learn, e.g. driving a car, which starts with the state of “ignorance is bliss”, over realizing that you want to drive a car but can’t, to consciously applying every step necessary to get a car moving, until you finally arrive at a state where you don’t even think anymore about how you drive – you just do it. After I spent already one year in my very first KM job trying to promote KM with senior management, it was this one slide during a meeting with my superiors that suddenly made the managers understand where we were with KM, and which resulted in the go-ahead for a real KM action plan backed by management and the development of a strategy for the organization. This slide was presented to me by a fellow participant of the KM Institute’s “Certified Knowledge Manager” training in 2007. It captures the essence of how organizations and therefore our work environments have changed over the past decades: away from a modern, hierarchical, intransparent and tightly controlled environment that sees infrastructure and money as its main assets, towards a post-modern organization with flat hierarchies and open and networked information flows that sees people and their knowledge as its main assets. The point is of course not that all are organizations resemble the right column today, but that 50 years ago, nobody questions the left column, while today these characteristics would be seen as obstacles to productive work. The table is inspired by the research of Philip Kotler, and is an excellent teaser to discuss our role as knowledge workers. The Cynefin framework (pronounced “key-nevin”) is a typology that describes in what contexts and problem situations a certain sort of explanations and/or solutions may apply, ranging from simple, to complicated, complex and chaotic problem situations. The framework was originally developed in 1999 in the context of knowledge management and organizational strategy by Dave Snowden, and provides a powerful way of assessing what kind of KM initiative may be right within a specific organizational context. It does e.g. 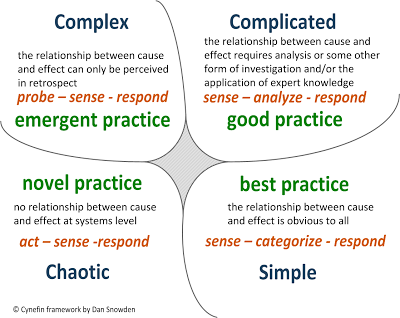 away with the myth that “good practices” are generally a good KM tool for organizations in any kind of situation, as according to Cynefin they really only apply to a “complicated” setting. This entire slide set is surely one of the most fabulous PowerPoints I’ve ever seen (the screenshot just shows four exemplary slides). They are a perfect example of slides that work as a resource by themselves without anyone presenting, because they actually tell a story. The entire slide set consists of a presentation in three parts, which was developed and is being used as a marketing pitch by the German consultancy company Besser 2.0 for their Enterprise 2.0 services. In the presentation they demystify in a perfect way what Web 2.0 means and how it changes the game for knowledge management inside organizations. Whenever I need to explain to someone why corporate social networking important I refer to this slide show, and it has never failed to leave an impression and provide ground for a fruitful discussion. This one is of course a classic, and should be part of any basic introduction to Knowledge Management. I like it because you can start with just asking the question and showing the iceberg picture, which will make the participants think and often discover themselves the key point behind this slide. I don’t know who came up with the iceberg analogy first, but evidently it is out there as common reference when you do a simple Google search. This particular iceberg image that I use in my presentations was taken from the blog ArtTech 101, although it is not clear with whom the copyright of the image resides. To get to Part 2 of this blog post, click here.